Bookbinding is the process of physically assembling a book from an ordered stack of paper sheets that are folded together into sections or sometimes left as a stack of individual sheets. The stack is then bound together along one edge by either sewing with thread through the folds or by a layer of flexible adhesive. For protection, the bound stack is either wrapped in a flexible cover or attached to stiff boards. Finally, an attractive cover is adhered to the boards and a label with identifying information is attached to the covers along with additional decoration. 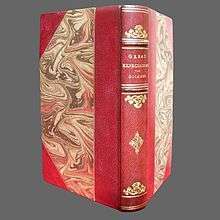 Book artists or specialists in book decoration can greatly expand the previous explanation to include book like objects of visual art with high value and artistic merit of exceptional quality in addition to the book's content of text and illustrations. Bookbinding is a specialized trade that relies on basic operations of measuring, cutting, and gluing. A finished book depends on a minimum of about two dozen operations to complete but sometimes more than double that according to the specific style and materials. All operations have a specific order and each one relies on accurate completion of the previous step with little room for back tracking. An extremely durable binding can be achieved by using the best hand techniques and finest materials when compared to a common publisher's binding that falls apart after normal use. Bookbinding combines skills from other trades such as paper and fabric crafts, leather work, model making, and graphic arts. It requires knowledge about numerous varieties of book structures along with all the internal and external details of assembly. A working knowledge of the materials involved is required. A book craftsman needs a minimum set of hand tools but with experience will find an extensive collection of secondary hand tools and even items of heavy equipment that are valuable for greater speed, accuracy, and efficiency. 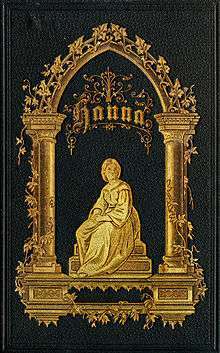 Bookbinding is an artistic craft of great antiquity, and at the same time, a highly mechanized industry. The division between craft and industry is not so wide as might at first be imagined. It is interesting to observe that the main problems faced by the mass-production bookbinder are the same as those that confronted the medieval craftsman or the modern hand binder. The first problem is still how to hold together the pages of a book; secondly is how to cover and protect the gathering of pages once they are held together; and thirdly, how to label and decorate the protective cover. Few crafts can give as much satisfaction at all stages as bookbinding—from making a cloth cover for a paperback, or binding magazines and newspapers for storage, or to the ultimate achievement of a fine binding in full leather with handmade lettering and gold tooling. 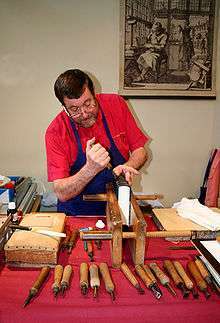 Before the computer age, the bookbinding trade involved two divisions. First, there was Stationery binding (known as vellum binding in the trade) which deals with making new books to be written into and intended for handwritten entries such as accounting ledgers, business journals, blank books, and guest log books, along with other general office stationery such as note books, manifold books, day books, diaries, portfolios, etc. Second was Letterpress binding which deals with making new books intended to be read from and includes fine binding, library binding, edition binding, and publisher's bindings. A result of the new bindings is a third division dealing with the repair, restoration, and conservation of old used bindings. With the digital age, personal computers have replaced the pen and paper based accounting that used to drive most of the work in the stationery binding industry. 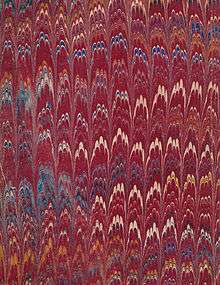 Today, modern bookbinding is divided between hand binding by individual craftsmen working in a one-room studio shop and commercial bindings mass-produced by high speed machines in a production line factory. There is a broad grey area between the two divisions. The size and complexity of a bindery shop varies with job types, for example, from one of a kind custom jobs, to repair/restoration work, to library rebinding, to preservation binding, to small edition binding, to extra binding, and finally to large run publisher's binding. There are cases where the printing and binding jobs are combined in one shop. A step up to the next level of mechanization is determined by economics of scale until you reach production runs of ten thousand copies or more in a factory employing a dozen or more workers. The book was not needed in ancient times, as many early Greek texts—scrolls—were 30 pages long, which were customarily folded accordion-fashion to fit into the hand. Roman works were often longer, running to hundreds of pages. The Greeks used to comically call their books tome, meaning "to cut". The Egyptian Book of the Dead was a massive 200 pages long and was used in funerary services for the deceased. Torah scrolls, editions of the Jewish holy book, were—and still are—also held in special holders when read. In addition to the scroll, wax tablets were commonly used in Antiquity as a writing surface. Diptychs and later polyptych formats were often hinged together along one edge, analogous to the spine of modern books, as well as a folding concertina format. Such a set of simple wooden boards sewn together was called by the Romans a codex (pl. 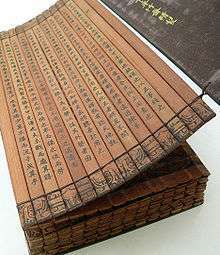 codices)—from the Latin word caudex, meaning 'the trunk' of a tree, around the first century AD. Two ancient polyptychs, a pentaptych and octoptych, excavated at Herculaneum employed a unique connecting system that presages later sewing on thongs or cords. At the turn of the first century, a kind of folded parchment notebook called pugillares membranei in Latin, became commonly used for writing in the Roman Empire. This term was used by both the pagan poet Martial and Christian apostle Paul the Apostle. Martial used the term with reference to gifts of literature exchanged by Romans during the festival of Saturnalia. According to T. C. Skeat, "…in at least three cases and probably in all, in the form of codices" and he theorized that this form of notebook was invented in Rome and then "…must have spread rapidly to the Near East…" In his discussion of one of the earliest pagan parchment codices to survive from Oxyrhynchus in Egypt, Eric Turner seems to challenge Skeat's notion when stating "…its mere existence is evidence that this book form had a prehistory" and that "early experiments with this book form may well have taken place outside of Egypt." Decorative binding with figurehead of a 12th Century manuscript - Liber Landavensis. 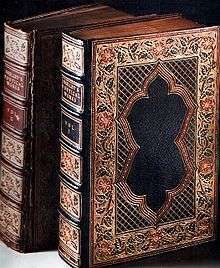 Western books from the fifth century onwards were bound between hard covers, with pages made from parchment folded and sewn on to strong cords or ligaments that were attached to wooden boards and covered with leather. Since early books were exclusively handwritten on handmade materials, sizes and styles varied considerably, and there was no standard of uniformity. Early and medieval codices were bound with flat spines, and it was not until the fifteenth century that books began to have the rounded spines associated with hardcovers today. Because the vellum of early books would react to humidity by swelling, causing the book to take on a characteristic wedge shape, the wooden covers of medieval books were often secured with straps or clasps. These straps, along with metal bosses on the book's covers to keep it raised off the surface that it rests on, are collectively known as furniture. Cai Lun (ca. 50 AD – 121) improved the first significant improvement and standardization of papermaking by adding essential new materials into its composition. 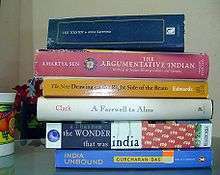 A hardcover, hardbound book has rigid covers and is stitched in the spine. Looking from the top of the spine, the book can be seen to consist of a number of signatures bound together. When the book is opened in the middle of a signature, the binding threads are visible. Signatures of hardcover books are typically octavo (a single sheet folded three times), though they may also be folio, quarto, or 16mo (see Book size). Unusually large and heavy books are sometimes bound with wire. Thermal binding uses a one piece cover with glue down the spine to quickly and easily bind documents without the need for punching. Individuals usually purchase "thermal covers" or "therm-a-bind covers" which are usually made to fit a standard size sheet of paper and come with a glue channel down the spine. The paper is placed in the cover, heated in a machine (basically a griddle), and when the glue cools, it adheres the paper to the spine. Thermal glue strips can also be purchased separately for individuals that wish to use customized/original covers. However, creating documents using thermal binding glue strips can be a tedious process which requires a scoring device and a large format printer. In either case, one of the modern standard for conservation and restoration is "reversibility." That is, any repair should be done in such a way that it can be undone if and when a better technique is developed in the future. Bookbinders echo the physician's creed, "First, do no harm." While reversibility is one standard, longevity of the functioning of the book is also very important and sometimes takes precedence over reversibility especially in areas that are invisible to the reader such as the spine lining. Many times, books that need to be restored are hundreds of years old, and the handling of the pages and binding has to be undertaken with great care and a delicate hand. The archival process of restoration and conservation can extend a book’s life for many decades and is necessary to preserve books that sometimes are limited to a small handful of remaining copies worldwide. A leaf (often wrongly referred to as a folio) typically has two pages of text and/or images, front and back, in a finished book. The Latin for leaf is folium, therefore "folio" should be followed by a number to distinguish between recto and verso. Thus "folio 5r" means "on the recto of the leaf numbered 5", although technically not accurate, it is normal to say "on folio 5r". In everyday speech it is common to refer to "turning the pages of a book", although it would be more accurate to say "turning the leaves of a book"; this is the origin of the phrase "to turn over a new leaf" i.e. to start on a fresh blank page. A quarto volume is typically about 9 in (23 cm) by 12 in (30 cm), roughly the size of most modern magazines. A sheet folded in quarto (also 4to or 4º) is folded in half twice at right angles to make four leaves. Also called: eight-page signature. A sextodecimo volume is about 4 1⁄2 in (11 cm) by 6 3⁄4 in (17 cm), the size of most mass market paperbacks. 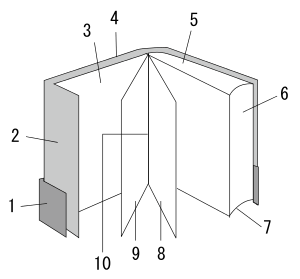 A sheet folded in sextodecimo (also 16mo or 16º) is folded in half 4 times to make 16 leaves. Also called: 32-page signature. In most of continental Europe and Latin America, titles are conventionally printed bottom-to-top on the spine so, when the books are placed vertically on shelves, the title can be read by tilting the head to the left. This allows to the reader to read spines of books shelved in alphabetical order in accordance to the usual way left-to-right and top-to-bottom. ↑ Burdett 1975, p. 9. ↑ "Online Etymology Dictionary". Retrieved 2007-07-20. ↑ Turner, Eric (1977). The Typology of the Early Codex. Philadelhpia: University of Pennsylvania Press. p. 38. ISBN 0-8122-7696-5. ↑ Such as: Columbia College Chicago, the University of Alabama, – Nova Scotia College of Art and Design and the University of the Arts in Philadelphia.